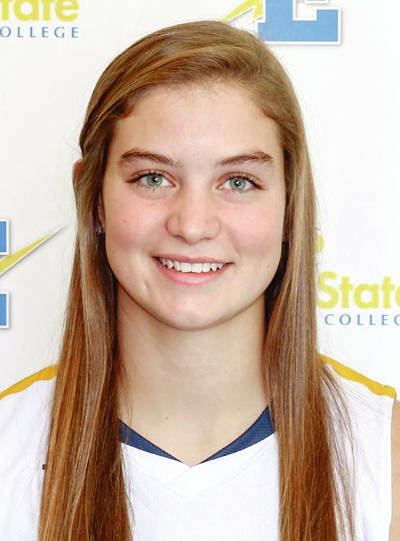 The Ohio Community College Athletic Association has named Edison State Community College sophomore Clair Schmitmeyer the D-II Player of the Week for Nov. 19-25. Schmitmeyer stuffed the stat sheet with 16 points, 11 rebounds, four steals and three assists in just 25 minutes played during a lopsided road victory at Miami University-Hamilton for the 6-1 Chargers. She crashed the offensive glass, hauling in seven offensive boards. Schmitmeyer converted on 7-of-16 field goal attempts (44 percent) and committed a lone turnover. This marks her second career conference weekly honor (also on Jan. 8, 2018). Schmitmeyer is averaging 9.3 points, 9.6 rebounds, 2.1 assists, and 2.6 steals per game in her second season at Edison State (6-2, 1-1 OCCAC). The Edison State men’s basketball team had the lead much of the game, before losing to Sinclair 84-80 Wednesday in OCCAC action. Edison drops to 6-2 overall and 0-2 in OCCAC play. The Chargers were lead by Lamine Komara with 23 points. Lacey Watson netted 20 points, Dakota Prichard scored 13 and Jaedyn Carter added 10. Edison will return to OCCAC play Saturday, hosting Bryant and Stratton at 3 p.m. The Edison State women’s basketball team also lost a road game to Sinclair 77-69 Wednesday in OCCAC action. Edison led 14-8 after oen quarter and 24-21 at halftime. Sinclair took a 39-36 lead after three quarters and outscored Edison 38-33 in the fourth quarter. Clair Schmitmeyer had a double-double for Edison with 12 points and 10 rebounds, while Kailani Broyles had 15 points, four assists and three steals. Sarah Bergman had 15 points and five rebounds, while Lauryn Gray had 10 points, eight rebounds and four assists. Sarah Pothast grabbed seven rebounds and blocked three shots. Kierre James played all 40 minutes and led Sinclair with a big game. She made 11 of 18 shots from the floor and 10 of 15 from the foul line in scoring 35 points, to go with four assists and three steals. Amanda Schroeder nearly had a triple-double with 20 points, 10 rebounds and seven blocks. Edison was 29 of 88 from the floor for 33 percent, including three of 19 from 3-point range for 16 percent. The Chargers made eight of 17 free throws for 47 percent. Sinclair was 23 of 45 from the floor for 51 percent, including four of eight from behind the arc for 50 percent. The Tartans made 27 of 38 free throws for 71 percent. Edison won the battle of the boards 52-42 and had 25 turnovers to Sinclair’s 27. Edison will return to OCCAC action Saturday, hosting Bryant and Stratton at 1 p.m.